Beneath the ocean, massive tectonic plates collide and grind against one another, which drives one below the other. This powerful collision, called subduction, is responsible for forming volcanic arcs that are home to some of Earth's most dramatic geological events, such as explosive volcanic eruptions and mega earthquakes. A new study published in the journal Science Advances changes our understanding of how volcanic arc lavas are formed, and may have implications for the study of earthquakes and the risks of volcanic eruption. Researchers led by the Woods Hole Oceanographic Institution (WHOI) have discovered a previously unknown process involving the melting of intensely-mixed metamorphic rocks—known as mélange rocks—that form through high stress during subduction at the slab-mantle boundary. Until now, it was long-thought that lava formation began with a combination of fluids from a subducted tectonic plate, or slab, and melted sediments that would then percolate into the mantle. Once in the mantle, they would mix and trigger more melting, and eventually erupt at the surface. "Our study clearly shows that the prevailing fluid/sediment melt model cannot be correct," says Sune Nielsen, a WHOI geologist and lead author of the paper. "This is significant because nearly all interpretations of geochemical and geophysical data on subduction zones for the past two decades are based on that model." Instead, what Nielsen and his colleague found was that mélange is actually already present at the top of the slab before mixing with the mantle takes place. 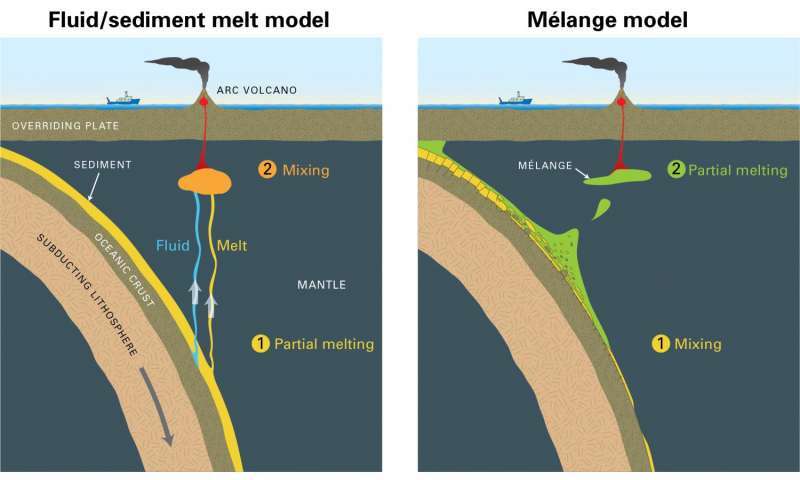 "This study shows—for the first time—that mélange melting is the main driver of how the slab and mantle interact," says Nielsen. This is an important distinction because scientists use measurements of isotope and trace elements to determine compositions of arc lavas and better understand this critical region of subduction zones. When and where the mixing, melting, and redistribution of trace elements occurs generates vastly different isotopic signature ratios. The study builds on a previous paper by Nielsen's colleague and co-author Horst Marschall of Goethe University in Frankfurt, Germany. Based on field observations of mélange outcrops, Marschall noted that blobs of low-density mélange material, called diapirs, might rise slowly from the surface of the subducting slab and carry the well-mixed materials into the mantle beneath arc volcanoes. "The mélange-diapir model was inspired by computer models and by detailed field work in various parts of the world where rocks that come from the deep slab-mantle interface have been brought to the surface by tectonic forces," Marschall says. "We have been discussing the model for at least five years now, but many scientists thought the mélange rocks played no role in the generation of magmas. They dismissed the model as 'geo-fantasy.'" In their new work, Nielsen and Marschall compared mixing ratios from both models with chemical and isotopic data from published studies of eight globally representative volcanic arcs: Marianas, Tonga, Lesser Antilles, Aleutians, Ryukyu, Scotia, Kurile, and Sunda. "Our broad-scale analysis shows that the mélange mixing model fits the literature data almost perfectly in every arc worldwide, while the prevailing sediment melt/fluid mixing lines plot far from the actual data," Nielsen says. Understanding the processes that occur at subduction zones is important for many reasons. Often referred to as the planet's engine, subduction zones are the main areas where water and carbon dioxide contained within old seafloor are recycled back into the deep Earth, playing critical roles in the control of long-term climate and the evolution of the planet's heat budget. These complex processes occur on scales of tens to thousands of kilometers over months to hundreds of millions of years, but can generate catastrophic earthquakes and deadly tsunamis that can occur in seconds. "A large fraction of Earth's volcanic and earthquake hazards are associated with subduction zones, and some of those zones are located near where hundreds of millions of people live, such as in Indonesia," Nielsen says. "Understanding the reasons for why and where earthquakes occur, depends on knowing or understanding what type of material is actually present down there and what processes take place." The research team says the study's findings call for a reevaluation of previously published data and a revision of concepts relating to subduction zone processes. Because mélange rocks have largely been ignored, there is almost nothing known about their physical properties or the range of temperatures and pressures they melt at. Future studies to quantify these parameters stand to provide even greater insight into the role of mélange in subduction zones and the control it exerts over earthquake generation and subduction zone volcanism.